White Marmotte was set up by Ian Huyton, ski teacher and international mountain leader (IML), in order to share his passion for the mountains. We offer ski touring, guided hiking in the Oisans and Mont Blanc regions, mountain skills training for skiers and walkers, and ski instructor training. Private ski lessons are also available in conjunction with the European Ski School. We can provide an instructor or IML for private guiding or bespoke courses. Ian has lived in Les Deux Alpes for the last six years and is happiest when ski touring, climbing or hiking in the Ecrins. He has skied and climbed for over thirty years, working as an instructor on three continents in the process. His teaching career began at Nevis Range in the Scottish Highlands back in 2004 and he still thinks this is the best job in the world. He has also taught in Andorra, New Zealand and Argentina before settling in France. 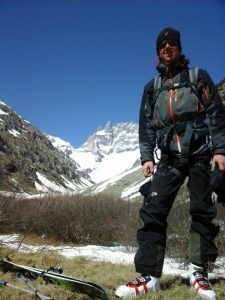 When not working or playing in the mountains, he writes for 2alpesnet.com and other websites (see writing). He also has a degree in physics, but that was a long time ago.